Every business deals with churn, and more often than not, it's much easier (and less costly) to keep an existing customer than it is to gain a new customer. It is also much easier to save a customer before they leave than it is to convince the customer to come back. Customer loyalty is something all brands strive for - understanding and preventing churn is critical to achieving this. So how do you know a customer is about to leave? And how do you take action before it’s too late? In this post, we’ll discuss how to measure indicators of churn, how to use that data to predict the likelihood of customer churn, and how to prevent at-risk customers from churning before it’s too late. Customer churn, also known as customer attrition, in its most basic form, is when a customer chooses to stop using your products or services. With each customer who churns, there are usually early indicators that could have been uncovered with churn analysis. Looking at both operational insights (e.g. declining repeat purchases, reduced purchase amounts) as well as experience insights along the customer journey is foundational to predicting churn. For example, a customer who has declined in recent visits and gives a Net Promoter Score of 7 after their latest shopping experience, could have an increased probability of churning. To start understanding the customer’s journey and the experiences they have, begin with setting up relational feedback requests that help you assess and diagnose key drivers of customer satisfaction. Once you’ve done this, you can move into measuring transactional experiences, such as purchase or post-support follow-up, so you can get a better sense of where you have detractors and build out a plan to follow up with them. Finally, you can map out the full customer journey and measure the key experiences across the journeys, from the moment there is a need (e.g. to purchase an item, to get help, to file a claim) to the moment it is fulfilled. The Qualtrics Customer Experience platform can help you not only measure these critical experience touchpoints, but analyze and surface key insights, such as likelihood to churn, so you can take action and drive outcomes for your business. Once you’ve built out a holistic view of your customer’s experience history with your brand, you need to combine it with operational data, such as repeat visits or credit card usage, to identify key drivers of churn and begin making predictions. Using deep learning and neural networks, Qualtrics Predict iQ combines experience data and operational data to help you predict individual customer behavior, and take action before it is too late. It all starts with building a model. 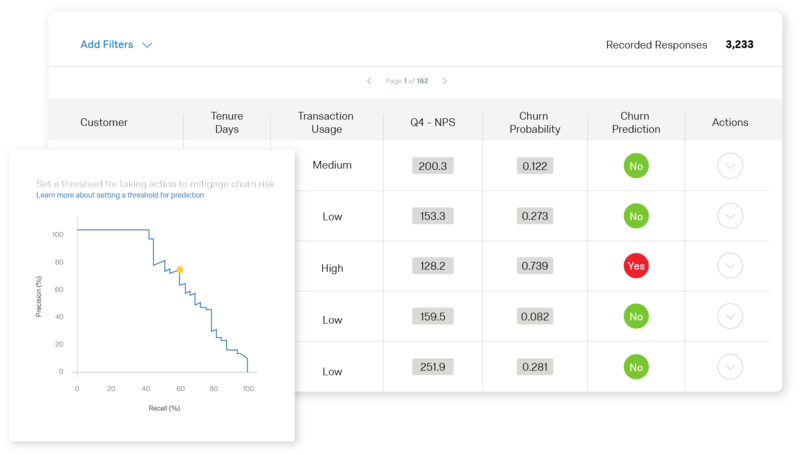 You can select your outcome variable, such as churn, and then Predict iQ looks at patterns in operational data, like return visits and credit card usage, and combines those with experience data, like satisfaction or likelihood to recommend. It automatically builds out a model that will predict the probability of churn for each individual customer. Now you can skip the days or weeks of complex analysis and creating prediction models. Predict iQ does the number crunching for you, so you get insights and results more quickly. Once you’ve predicted whether a customer is at risk of churning, closing the loop with those at-risk customers is the critical next step. Predict iQ can help you create alerts and tickets for customers in various states of unhappiness with your products or services. For example, you can set a target which requires all tickets for customers with an 80% likelihood to churn to be resolved within 24 hours. If you get a low score on an experience survey and the churn threshold is triggered for a specific customer, Qualtrics automatically generates a ticket requiring specific attention and immediate resolution. With Qualtrics and the action-planning module, you can go beyond continuously reacting to customer pain, taking insights from the closed-loop process to drive system-wide improvements that avoid customer issues altogether. Employees can collaborate with others, tag owners, set deadlines, and even supply step-by-step guidance.